The LACC Undergraduate Certificate in Latin American and Caribbean Studies provides a strong foundation in Latin American and Caribbean Studies and offers students specialized expertise in the region, as well as preparation for graduate studies and professional careers. 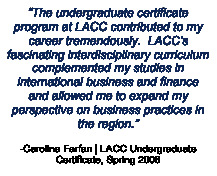 For students pursuing a bachelor’s degree, the LACC Undergraduate Certificate is designed to complement the student’s discipline or major area of study. In order to enroll in the LACC Undergraduate Certificate, a student must be admitted to FIU as a degree seeking student, but there are no additional prerequisites. A total of 18 undergraduate credit hours with a grade of C or better. Our core course, LAS 3002 Introduction to Latin American and Caribbean Studies is required for all certificate students. Students should take LAS 3002 at the start of the Certificate Program. Other Courses must be selected from the Latin American and Caribbean Studies Approved Course List or be approved by the LACC Certificate Advisor. Courses may include those within the student’s major, but must also be selected from at least two disciplines outside the student’s major. Students are required to take a two-course language sequence at FIU in Spanish, Portuguese, Haitian Creole, or French at the student's tested level. Up to six language credits may count towards the fulfillment of the required 18 credit hours. The language requirement may be waived if a student demonstrates proficiency at the intermediate-high level on a language proficiency exam. Proficiency exams are scheduled by the LACC Certificate Advisor. The minimum GPA to apply for and receive the LACS undergraduate certificate is 2.5. This master list contains the FIU classes that arecatalog for credit towards a LACC Undergraduate Certificate. Please check the FIU course catalogue to verify when classes are offered. Students may submit other classes for approval by LACC advisors. Call 305 348-2894 to make an appointment with the certificate advisor. Please bring the class syllabus to your appointment.